Many of these thinkers were based in the United States. 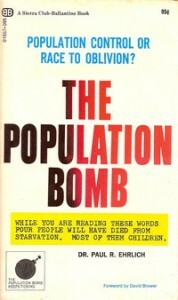 In 1968, Stanford University professor Paul R. Ehrlich published the best-selling book The Population Bomb, in which he warned that overpopulation would soon lead to mass starvation. By 1977, Robert McNamara — the former U.S. secretary of Defense who by then had become president of the World Bank — was declaring that rapid population growth could prove as much a threat to humankind as nuclear war. Birth control became a cornerstone of aid policy. And some were even talking about “how we’d need to start triaging aid because places like Bangladesh were unsalvageable,” Eberstadt says. “They were saying that we should focus aid on what they called ‘the walking wounded’ who could be saved.” … Indeed, China wasn’t even the first country to experiment with forcible population control. In the late 1970s, Indira Gandhi, then prime minister of India, introduced a program that involved the involuntary sterilization of many men and women. The ensuing popular outcry not only brought the program to a swift end but helped sweep Gandhi from office. That’s what can happen in a democracy like India. Who Was The First To Try To Manipulate Birthrates? Not China! NPR.org, October 31, 2015. In my youth the big thing was ZPG: Zero Population Growth. The real problem in the world, we learned in our teens from the media and pundits, was that we had too many people. The worldwide explosion of people was a greater threat than nuclear warfare it was claimed. Setting aside whether the belief was based upon hard science (i.e., good data) or not, the ZPG initiative now looks a lot like the War on Drugs, the War on Cancer and now the War on Climate Change. We get excited about the next big new problem and then we find enough data, often selectively picked, to support our existing beliefs. We then expend considerable time and resources on efforts that are not based on sufficient reality. This happens often in the business world but the good news is that the market will reward those who were right and extinguish those who guessed wrong. In the political world the impact can be much worse and the failure much more impacting to individuals (e.g., India mandating sterilizations). Is your project based upon good hard data or does it just seem the “obvious” thing to do and hence headed for failure?